One of backpacker’s biggest enemies is dehydration. If you aren’t aware of dehydration symptoms, it can sneak up on you quickly. Dehydration can cause mild discomfort to serious harm. The majority of your body is composed of water. In fact, up to 75% of your weight is due to it. Backpacking is a physically demanding sport and can deplete your fluids quicker when performing simpler, everyday tasks. Think of your body like a car – it runs much better with the proper fluids and you run into fewer problems. Staying properly hydrated allows your body to work at its best – it has better endurance, regulates your temperature better, burns calories more efficiently and recovers from physical activity better. Your body is constantly using its fluid supply through breathing, sweat, urine, etc. Dehydration begins when the amount of water leaving your body is greater than the amount taken in. Your body knows when it is not being supplied with enough fluids to function properly and it gives you signs. It is important to know these signs and respond to them in order to prevent harm to yourself. The above symptoms are the most common. It’s important to understand that dehydration affects each person differently. Most importantly, pay attention to your body. We all know when we are not feeling right. A good rule of thumb is to pay attention to your urine. I know it sounds gross, but it’s a really good indicator. If you’re urinating enough and it’s clear, you’re good. Once you start urinating less often, less in volume and it starts getting darker, you can instantly know you need to be drinking more water. If you do find yourself dehydrated, it is important to immediately begin replenishing your fluids. However, you shouldn’t just guzzle down a quart of water. Take small sips slowly. Too much water too quickly can strip your body of electrolytes (chemicals needed for cells to perform electro-chemical reactions). You can get electrolytes from food, but eating food while dehydrated is counterproductive to rehydrating yourself. Carry powdered sports drinks with you to ensure you replenish your electrolytes. If you experience the more extreme symptoms, medical attention is vital. 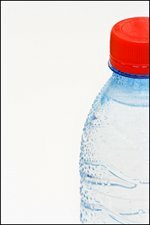 for information about how you can make water found in the wild safe to drink. And for those fun and exciting legal reasons, we must add a final note. We are not medical professionals and the above information is not intended for diagnosis or treatment of any medical conditions.